On August 26th, the commercialization efforts of staff and students who are developing new technologies, products or services from Curtin research were recognized at the Curtin Commercial Innovation Awards. Anne Furness and her team from the School of Physiotherapy and Exercise Science won the Teaching and Learning Award for their Virtual Home Visit (VHV) Training Tool. 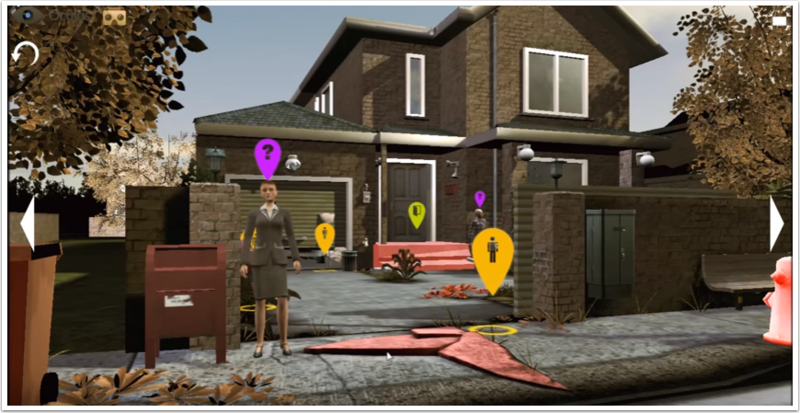 The Virtual Home Visit is a collaborated effort between LearnBrite and Furness’ team (Curtin University in Australia), to train and assess physiotherapy professionals. VHV uses LearnBrite’s Virtual Reality platform combining the best of HTML5, WebGL (Web Graphics Library), ResponsiveVoice Text-To-Speech, and 3D Technology. This immersive eLearning experience works on phones, tablets, computers, and VR headsets. LearnBrite is first in the world to meet the need for immersive browser-based 3D eLearning systems, compatible with learning management systems, such as Moodle and xAPI, or in a standalone environment that can be easily integrated deployed and updated without the need for software installation, plugins or IT security issues. The VHV Tool is primarily developed for the training of health care professionals by simulating home-based aged care. The tool is grounded by learning methods and validated by research demonstrating real improvements in outcomes. It provides the students with the experience of identifying falls risks and hazards and a platform for social interactions relating to older adult care. Information obtained from this experience is used to assess and develop a falls risk management plan that will assist the client to remain at home. Virtual Reality simulation is a medium for practice and learning that is applicable to many disciplines. This amplifies real experiences with guided simulation in a controlled environment which is immersive in nature. This training strategy is effective in designing learning experiences, as well as the implementation of learning objectives. This has been widely accepted in the fields of aviation, military, healthcare and medicine. When it was first introduced, the cost for simulated training was high and only a few institutions perceived it as a worthwhile investment for the long term. This turned out to be a very durable form of education and training. With the proper technology, the simulation can be very flexible while reducing the manpower and technician costs during setup, implementation, and maintenance. Simulated environments provide learning and re-learning to perfect the skills and reduce errors before training with a live patient. In addition, this can expose the students to more rare scenarios and simulated situations that are less likely faced in a clinical setup. Tagged Curtin, Education, elearning, Virtual Reality, VR.